Good News! ZKTeco Co., Ltd. (abbr. ZKTeco) has been awarded the 16th CPSE “Golden Cauldron Award”. 28th October 2017, the 16th CPSE “Golden Cauldron Award” Presentation Ceremony was held in the Kun’s Roc Ballroom in the Shenzhenair International Hotel. 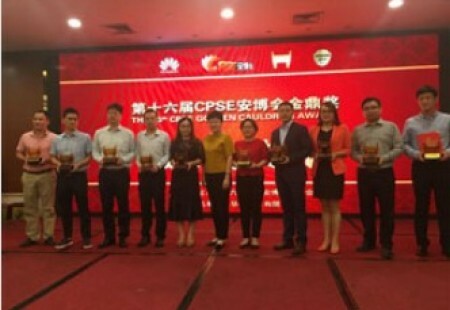 After selection, tests and publication displays of submitted products to the 16th CPSE, the CPSE Organizing Committee invited related experts to form the Selection Committee, with deliberate selection and inspection, ZKTeco’s products have been selected for the “16th CPSE Golden Cauldron Award”. ZKTeco shall insist to the research & development and productization, of the hybrid biometric verification technique, AI and smart security. The Award indicates the recognition from the Organizing Committee towards ZKTeco’s development philosophy, future prospects, and the continuous and consistent efforts in the security industry. In the future, ZKTeco shall remain to the hybrid biometric verification techniques, create the new era of smart security and contribute to the development of the security industry.